100 Dollar Bill - The 100-dollar note was put into circulation through major banks in November 2011, made of a durable polymer instead of the traditional paper notes. The notes are dominantly brown in colour; the front design on the note features former prime minister Sir Robert Borden and the design on the back depicts the discovery of insulin. 50 Dollar Bill - The 50-dollar note is predominantly red in colour and is printed on polymer. The front features a portrait of former Prime Minister William Lyon Mackenzie King and the back depicts a research icebreaker from the Canadian Coast Guard, Amundsen. 20 Dollar Bill - The 20-dollar bank is predominantly green in colour and is prrinted on polymer. The front features Queen Elizabeth II and the Vimy Ridge memorial is displayed on the back. 10 Dollar Bill -The current 2017 ten-dollar note is to commemorate 150 years of our confederacy dominantly purple in colour. The Front of the note features Sir John A. Macdonald, Sir George-Étienne Cartier, Agnes Macphail and James Gladstone – four parliamentarians that played significant roles in Canada’s history. The back of the note tells the story of Canada’s landscapes with images from coast to coast. 5 Dollar Bill - The five-Canadian dollar note, is predominantly blue.The bill features a portrait of Canada's seventh prime minister Sir Wilfrid Laurier on the front; the back features an astronaut working with Dextre attached to the Canadarm2. 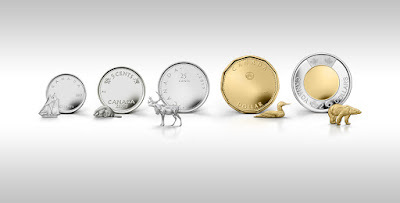 Toonie - The Canadian two-dollar coin, commonly called the toonie, is the most valuable of the Canadian coins. 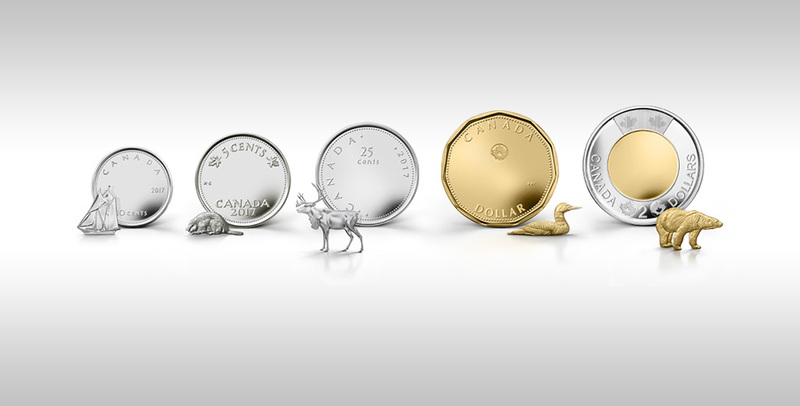 The toonie is a bimetallic coin which on the reverse side bears an image of a polar bear. The flip side, like all other current Canadian circulation coins, has a portrait of Queen Elizabeth II. Quarter - Short for quarter dollar this coin usually features a Caribou on it's face. Nickel - The Canadian five-cent coin, commonly called a nickel, had been introduced in 1858 as a small, thin sterling silver coin, that was colloquially known as a "fish scale," not a nickel. Since 1937 the nickel has proudly showcased a beaver sitting on a rock. Fun Fact: To Commemorate the 150th Anniversary of the Confederation of Canada, The 2017 Toonie's design is titled 'Dance of the Spirits', and shows a pair of paddlers dwarfed by a night sky alive with the ever-shifting movement of the Aurora Borealis. Thanks to the addition of luminescent material in the ink covering the Aurora, the coin glows in the dark.